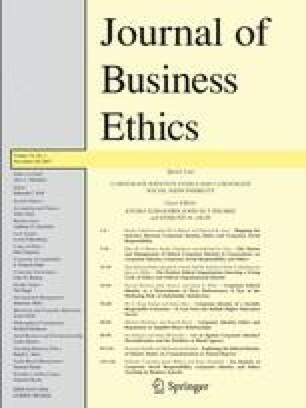 In this article, we empirically assess the impact of corporate ethical identity (CEI) on a firm’s financial performance. Drawing on formulations of normative and instrumental stakeholder theory, we argue that firms with a strong ethical identity achieve a greater degree of stakeholder satisfaction (SS), which, in turn, positively influences a firm’s financial performance. We analyze two dimensions of the CEI of firms: corporate revealed ethics and corporate applied ethics. Our results indicate that revealed ethics has informational worth and enhances shareholder value, whereas applied ethics has a positive impact through the improvement of SS. However, revealed ethics by itself (i.e. decoupled from ethical initiatives) is not sufficient to boost economic performance. Kinder, Lyndenburg, Domini Research and Analytics Inc.
Pascual Berrone is a PhD candidate of the Business Administration and Quantitative Methods Ph.D. program at the Universidad Carlos III de Madrid. His current research interests focus on business ethics, stakeholder theory, and various aspects of the interface between corporate governance mechanisms and corporate social responsibility. His interests also include ethical, environmental and social issues and their impact on firms' overall performance. Dr. Jordi Surroca is an Assistant Professor of Management at the Department of Business Administration at the Universidad Carlos III de Madrid. He holds a PhD in Business Administration and a Licentiate Degree in Business and Economics from Universitat Autònoma de Barcelona. His research interests center on stakeholder management, firm strategy, innovation, and corporate governance. Dr. Josep A. Tribó is Associate Professor of Finance in the Department of Business Administration at the Universidad Carlos III de Madrid. He has a PhD in Economic Analysis from the Universitat Autònoma de Barcelona and a Licenciate Degree in Theoretical Physics by Universitat de Barcelona. His research interests are Corporate Finance and the financing of R&D. His work has been published in journals such as Applied Economics, International Journal of Production Economics.